Michael: There is nothing quite as good as feeling sorry for yourself, is there? They just don’t throw parties like this one anymore. And if they did, no one would necessarily even notice. THE BOYS IN THE BAND was born as a play in 1968, off-Broadway. It ran for 1001 performances and was optioned by Hollywood just two years later. Today, this would not be so uncommon. It would not have been so uncommon in 1968 either but this was no ordinary play. 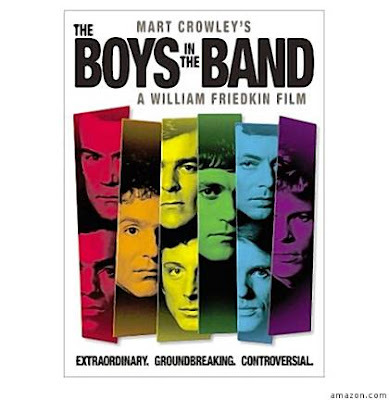 THE BOYS IN THE BAND was the first gay-themed play written with every intention by its author, Matt Crowley, to be seen and enjoyed by mainstream audiences. Though I wasn’t alive to feel the impact the play had, I can’t imagine how this play, where nine men, almost all gay, spend an evening celebrating a birthday by lashing out and breaking each other down in a drunken stupor, could have been appreciated by mainstream audiences. It embodies pain, struggle and desire but it keeps everything bottled up, making for quite an explosion. THE BOYS IN THE BAND is not an easy movie experience. It is however, an enlightening one. It has been 40 years since audiences first heard Crowley’s telling words and just under that since William Friedkin brought it to the screen. The world has changed. Attitudes have changed. Neither Crowley nor Friedkin were the least bit concerned with the attitudes of the audiences that saw this landmark. It was the attitudes of the characters that mattered. 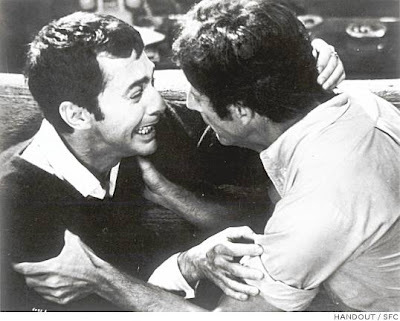 THE BOYS IN THE BAND debuted to audiences before the gay rights liberation movement even officially began, but spoke in a voice that needed to be heard. The boys in this particular band come from all different walks. They are closeted, married. They are depressed, on drugs. They live above their means to portray a certain image. They drink and they drink until they no longer have the burden of having to think any longer about how miserable they are with life and with themselves. And that’s only the first act. The second act plummets into despair. There are no more laughs to be had but there is an unexpected emotion seeping beneath the surface and sitting in the back of this party like the guest no one saw arrive – love. It may come out as loathing but it is love they have each felt for another man that has manifested itself as this hate. One can only hope that each character is able to tear away that hate and get back to the love that hides in their hearts. . Watching THE BOYS IN THE BAND now, having just been remastered and re-released for its 40th anniversary with three new featurettes looking back on the groundbreaking release and a brand new commentary with Friedkin, one can’t help but notice that though so much has changed for gay men and women, that so many of the issues these men faced are just as prominent today as they were then. And so again, one can only hope that the love that started it all will prevail and heal rather than destroy.